If you follow my articles, you know how big a fan of new technology I am. 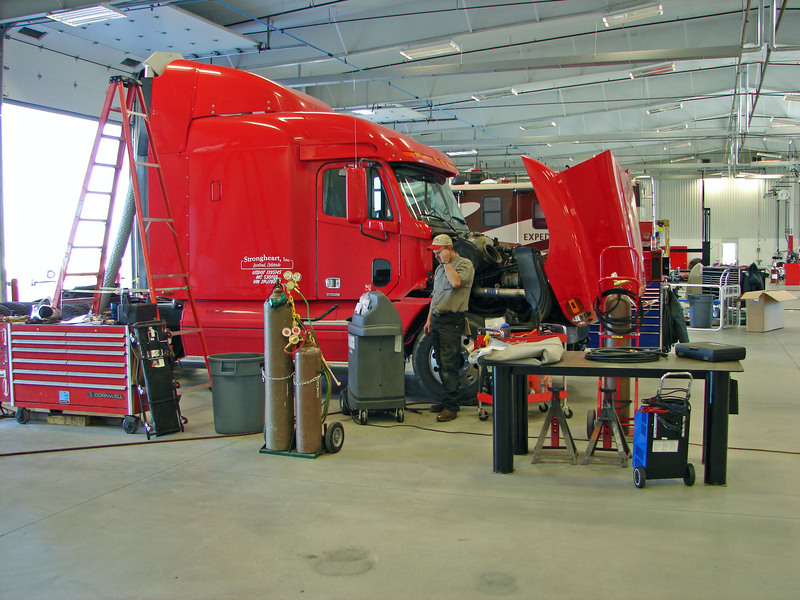 At the new Transwest Truck Trailer RV, facility north of Denver on I-25, is an awesome machine called a Road Simulator. 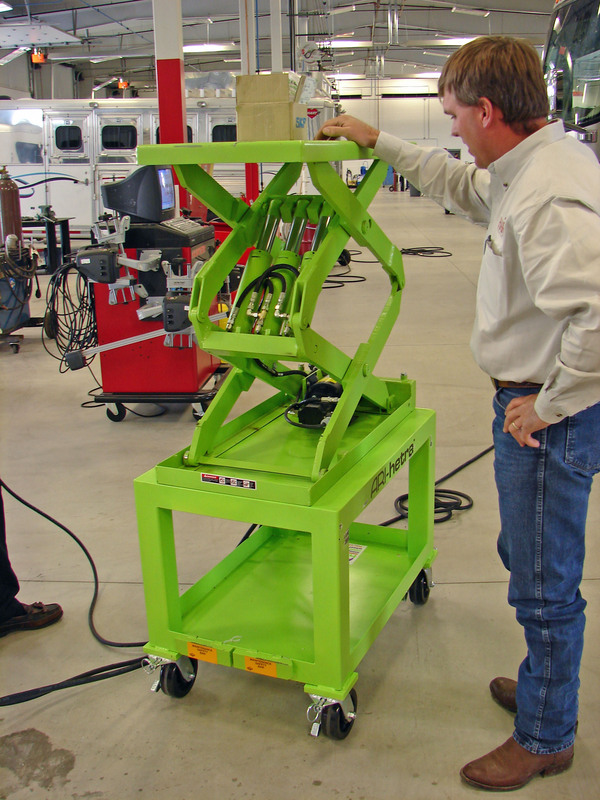 Looks kind of like a dyno, but uses it’s rollers to test brakes. 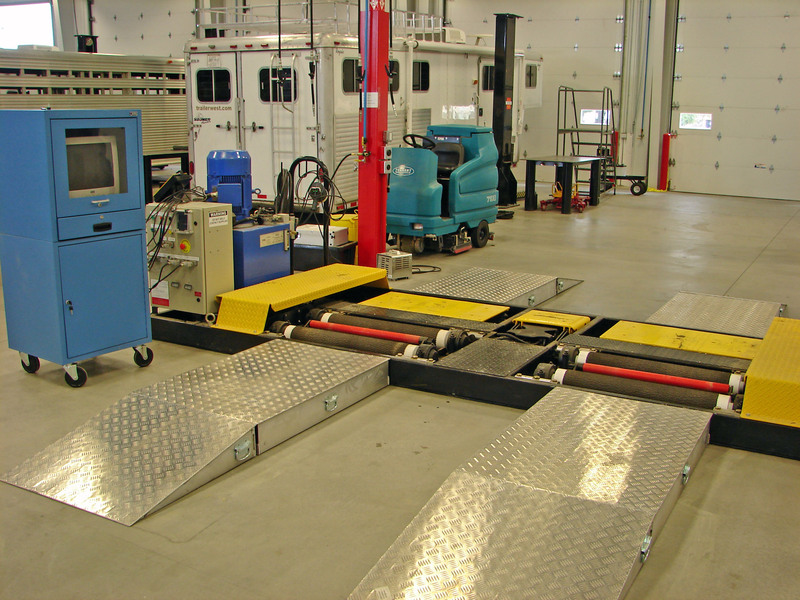 They can test trucks, RV’s and trailers. 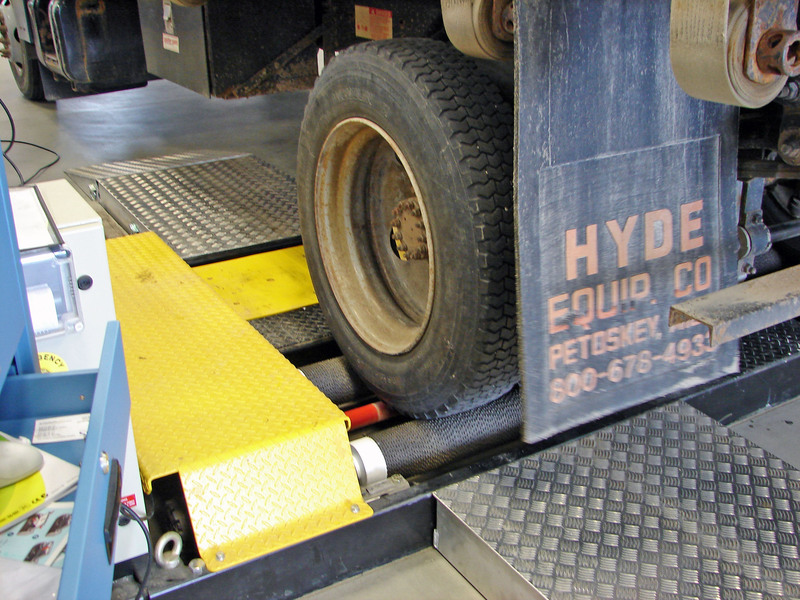 It’s certified for DOT brake inspections. 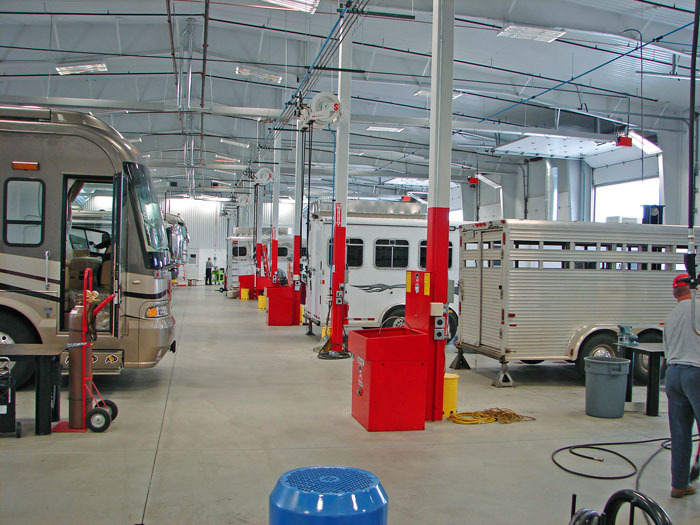 Transwest uses it to test all their new horse trailers so they are ready for THE road. 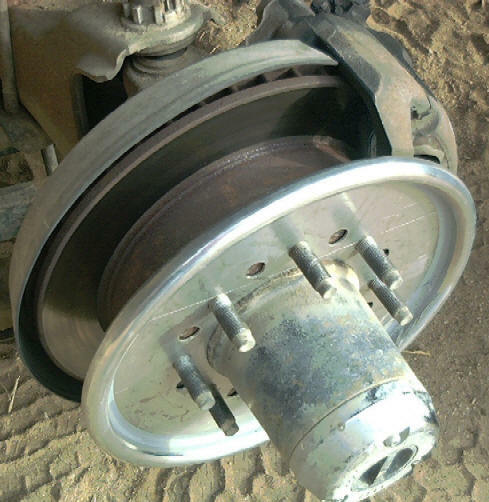 It would surprise you how it can find just a torn axle seal leaking on the brakes. 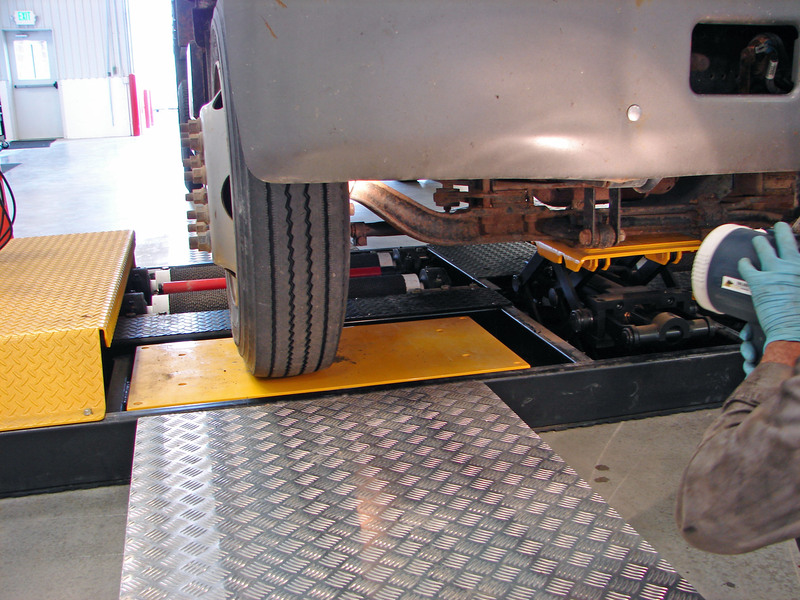 With the kind of traffic we pull trailers in, testing brakes becomes routine. 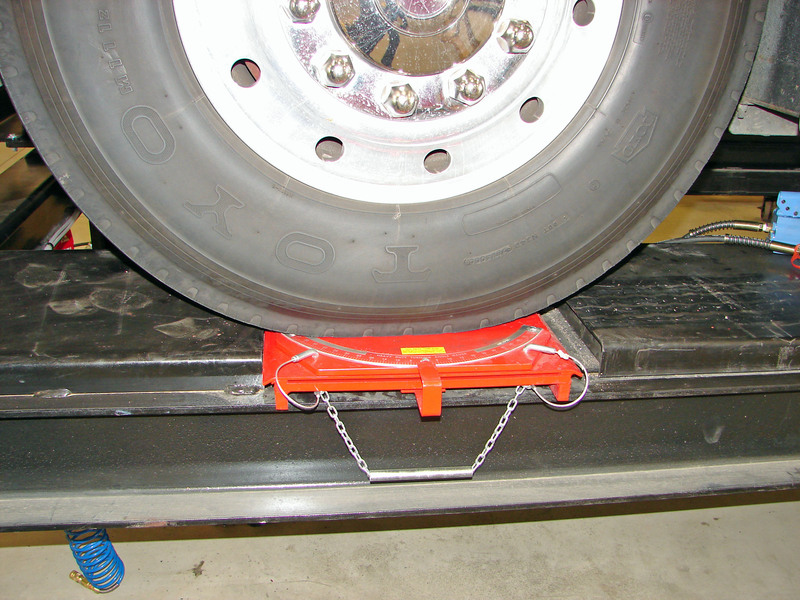 Another feature of the Road Simulator, load cells, it can weigh each axle. 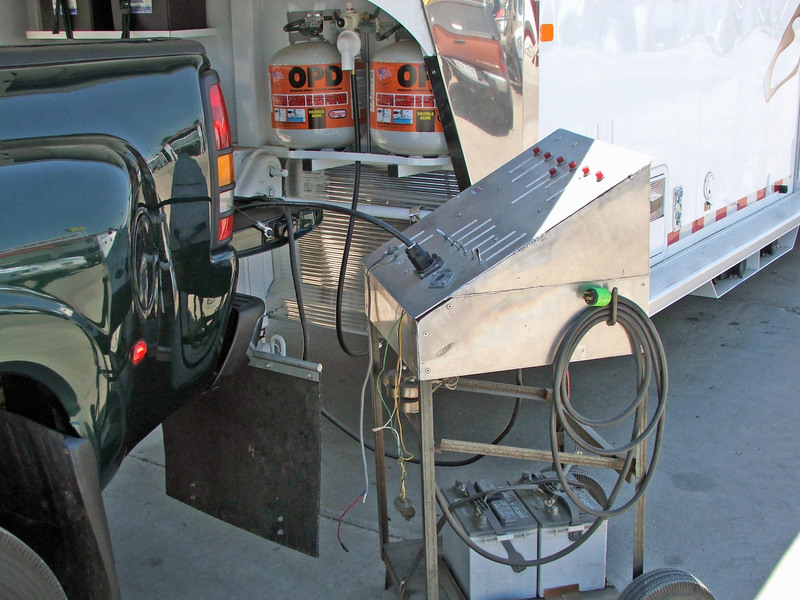 Transwest Truck Trailer RV has the coolest trailer fixing equipment. 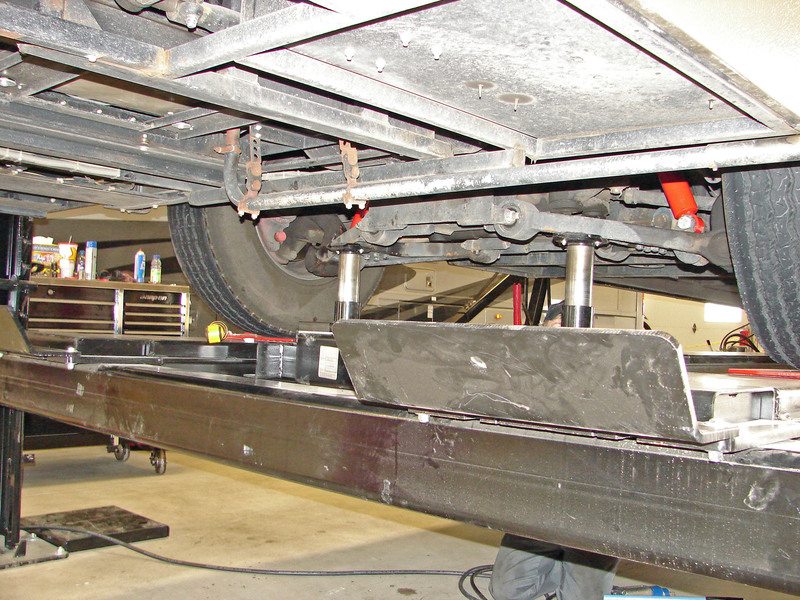 A worn suspension could be causing your rig to wonder all over the road or just be unsafe. The Road Simulator can find these problems too. 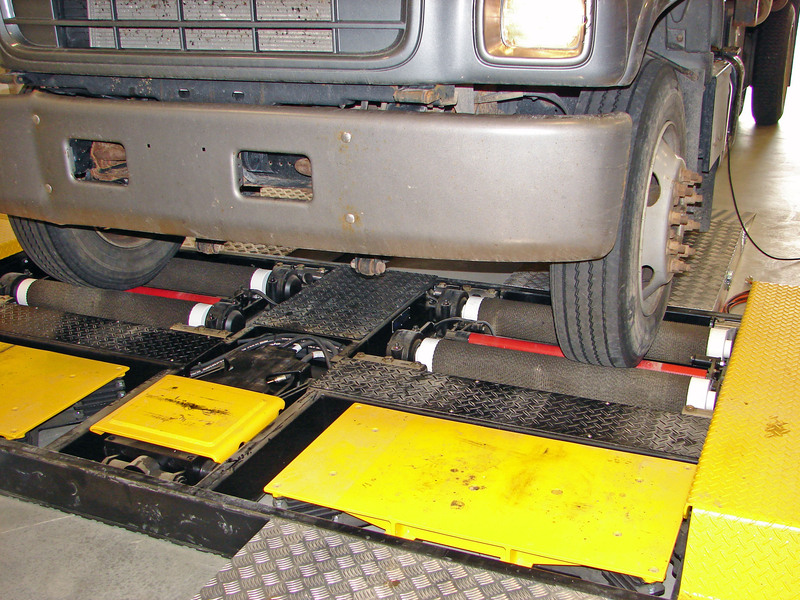 With shaker plates that move the wheels in all directions, it can find problems like bad king pins, tire rods, drag links, loose bearings etc. 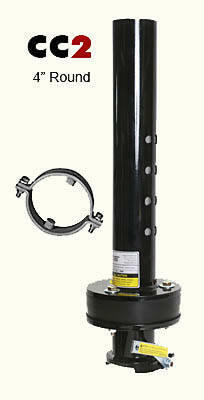 and find wear in the suspension. 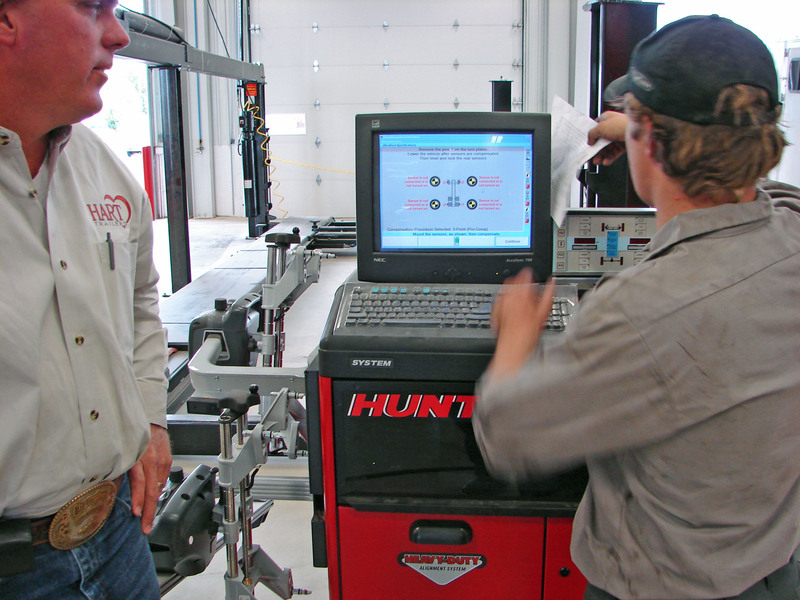 Much faster than a mechanic jacking up a truck and trying to track down problems by the process of elimination. I didn’t even know such technology existed. 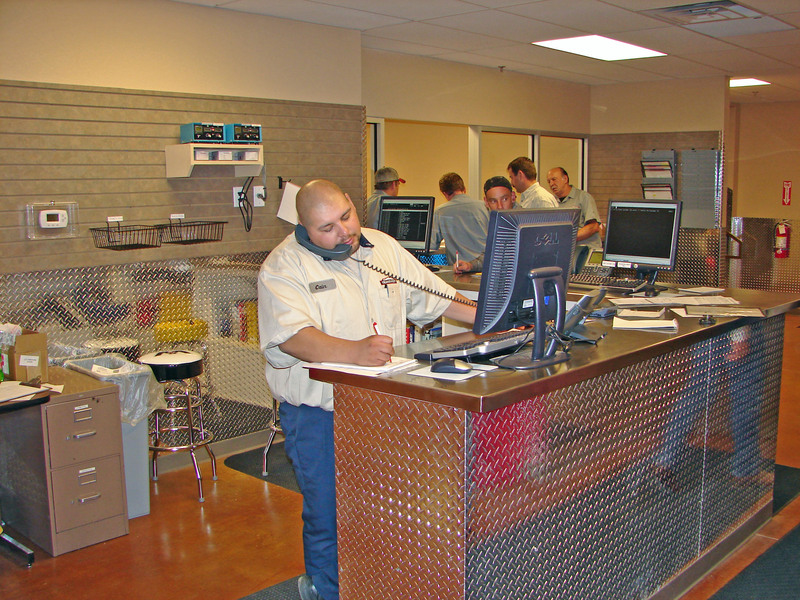 Leave it to Transwest Truck Trailer RV to fully equip their state of the art 20 bay service center with the latest and greatest. 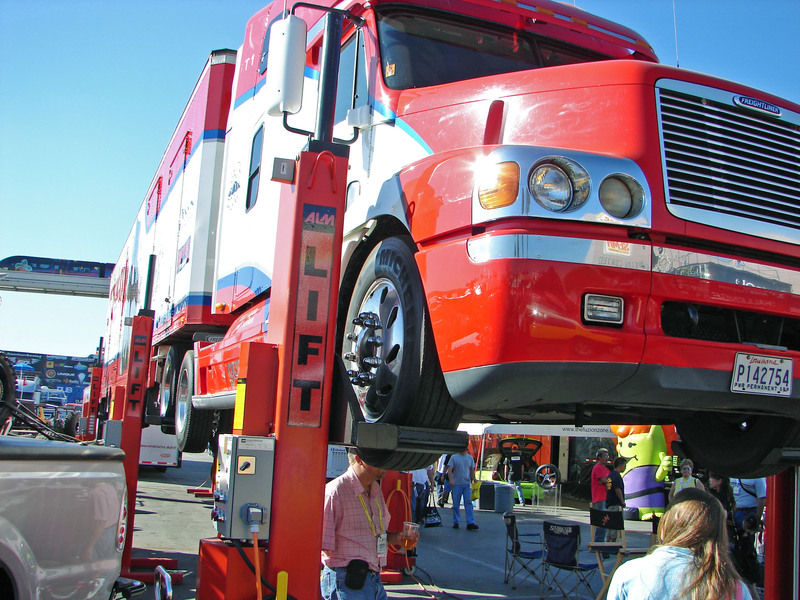 It’s fun just watching the mechanics jack up trucks and trailers and wiggle the tires in all directions. 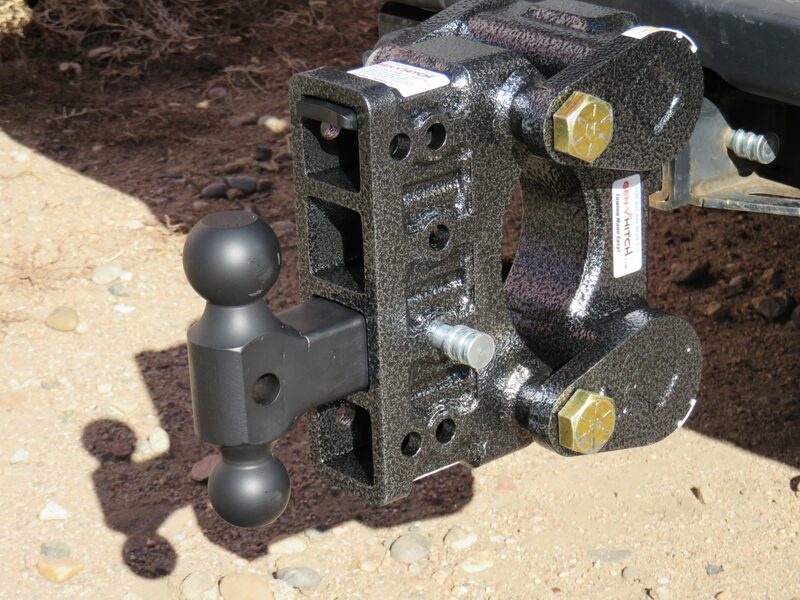 Then you know which spring pins are worn, which ball joints are loose, which brake is working less than the rest. 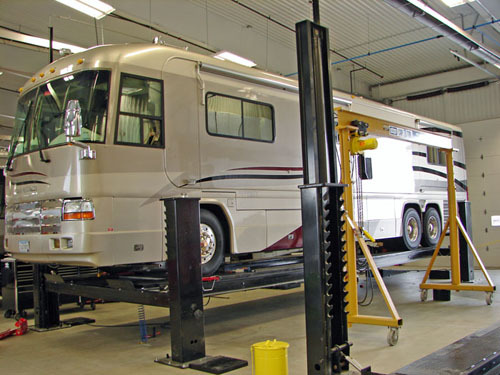 It was a big move up the road to the new well equipped state of the art 20 bay shop on 15 acres, where Transwest Truck Trailer RV can fix anything on RV’s, trucks and trailers with the latest technology, including wheel alignment machines. 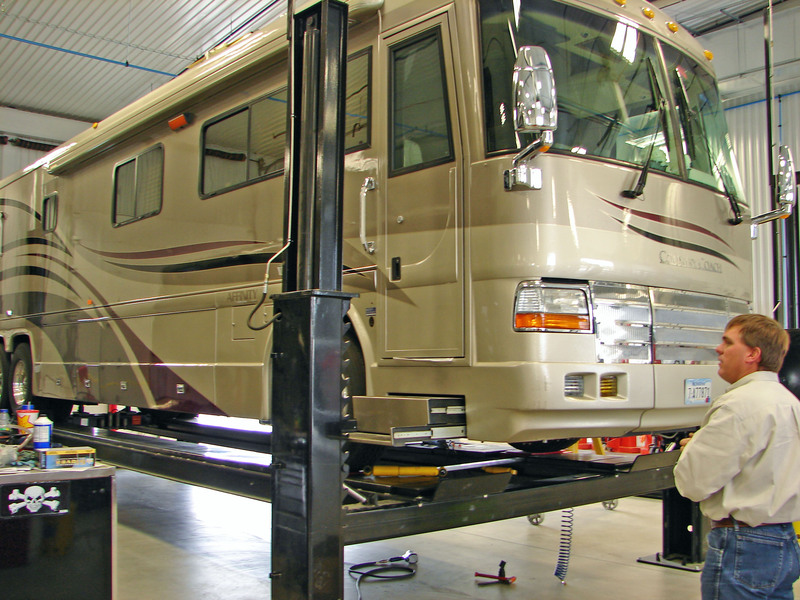 They can even align the new RV coaches with independent front suspension. The all asphalt lot is nice too, no mud, dust or gravel, so I can run in and out of all the LQ’s without leaving tracks. 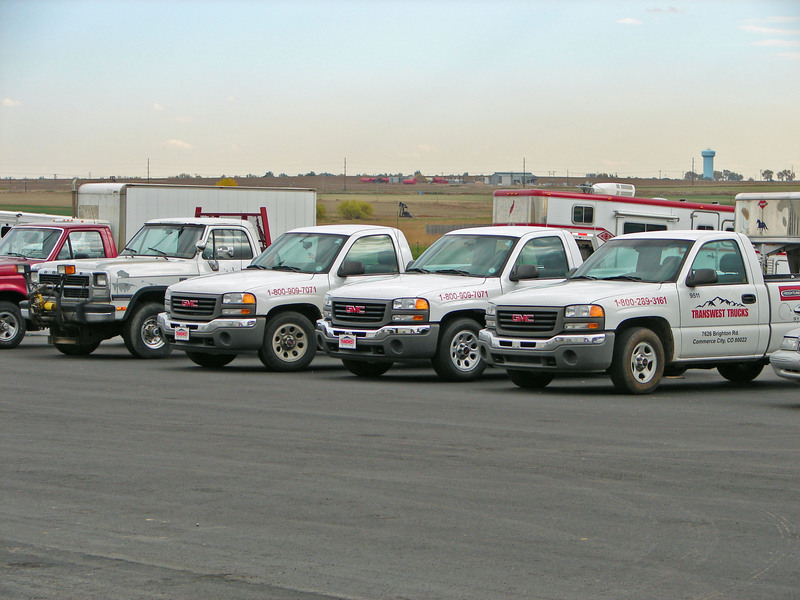 Only trailer dealer I can think of in Colorado with a totally paved lot. 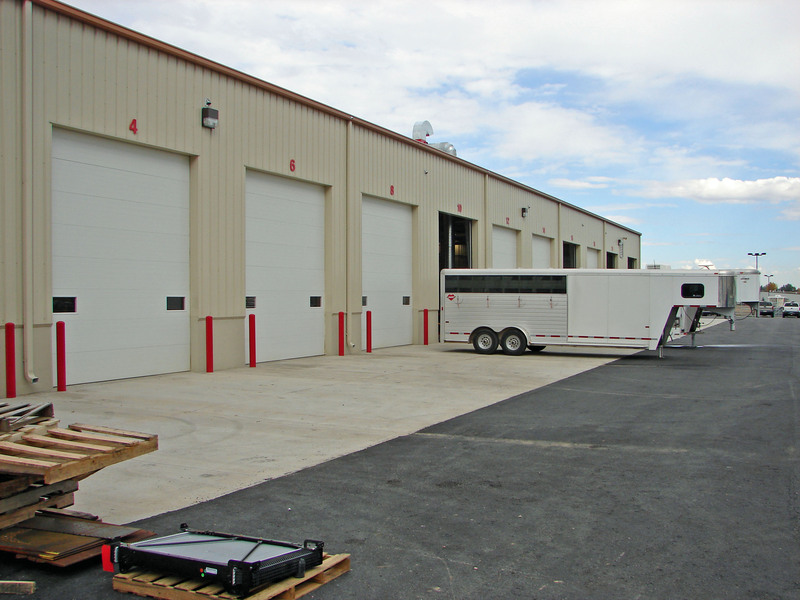 Nice facility to tour premium aluminum horse trailers with Living Quarters. 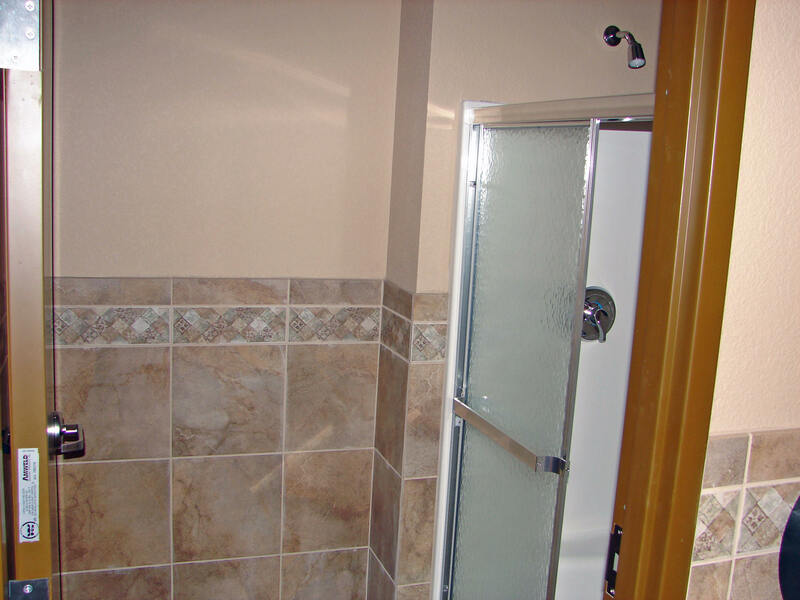 Living Quarters are a growing option. 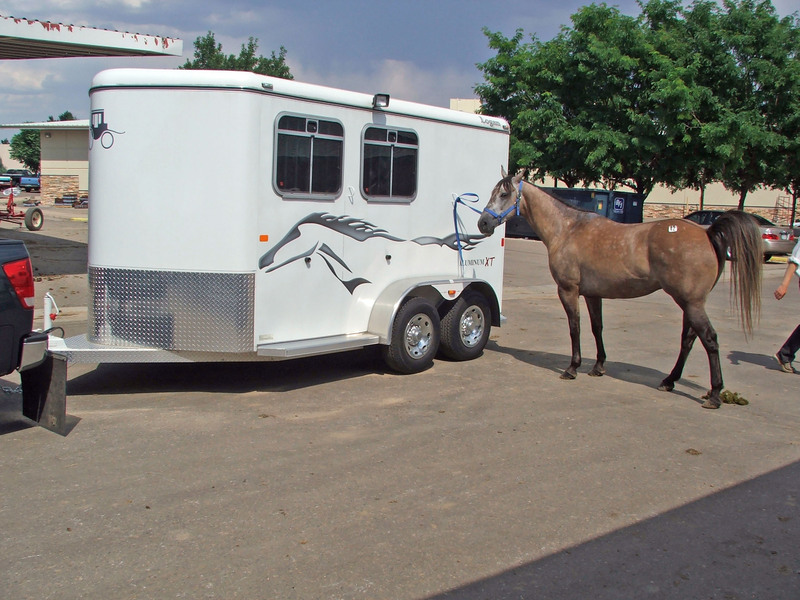 Similar to RV’s, these comfortable trailers make it easier to turn horse events into a family vacation. 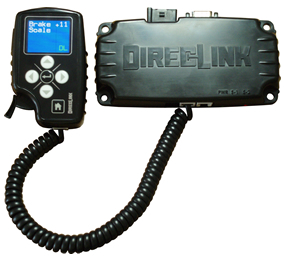 I plan on using one to tour some RV parks next summer, with and without horses. 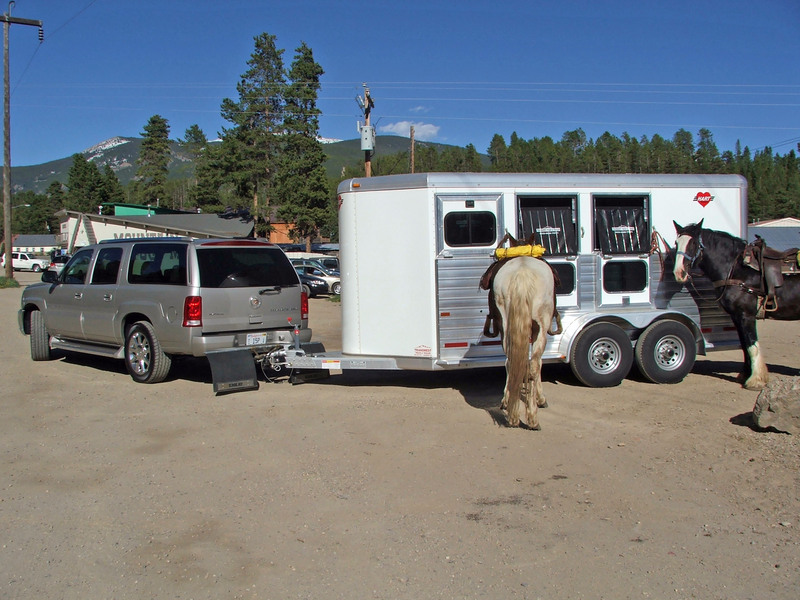 Just because there are horse stalls in the rear doesn’t mean you can’t put the golf cart, ATV, motorcycle and mother-in-law back there. 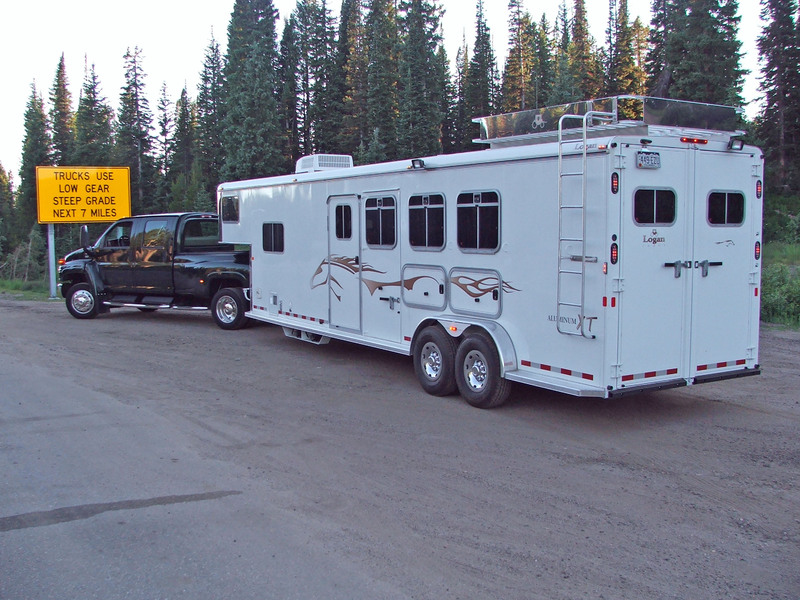 Why not, Toy Haulers are popular RV trailers that does all that but can’t haul horses. 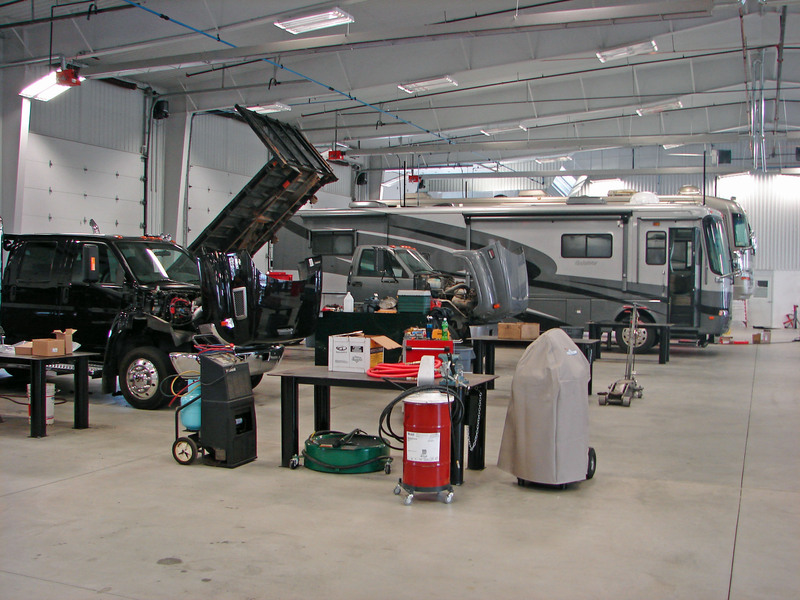 Enough room inside the new showroom for trailers. That will be nice this winter. 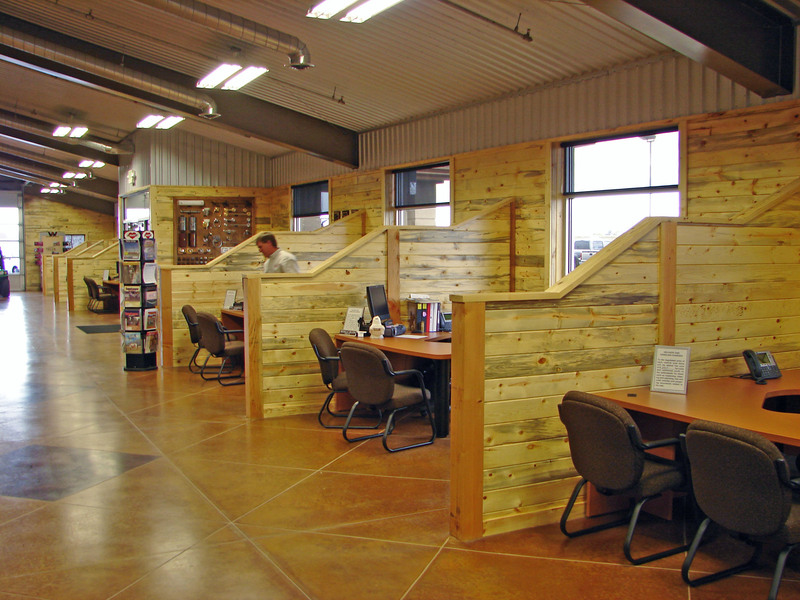 Blue stained (beetle kill) knotty pine stalls separate offices, with a view of the mountains that just makes you smile. 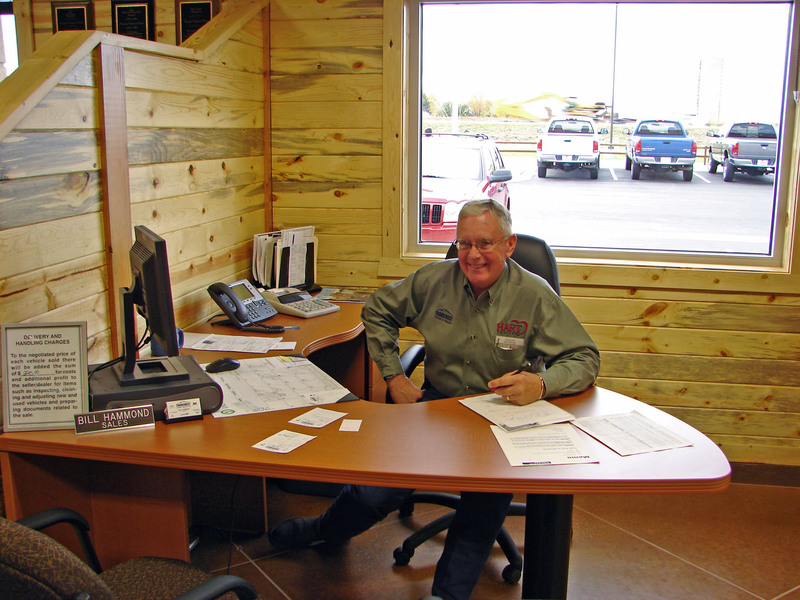 Nice having room for the friendly knowledgeable sales staff. 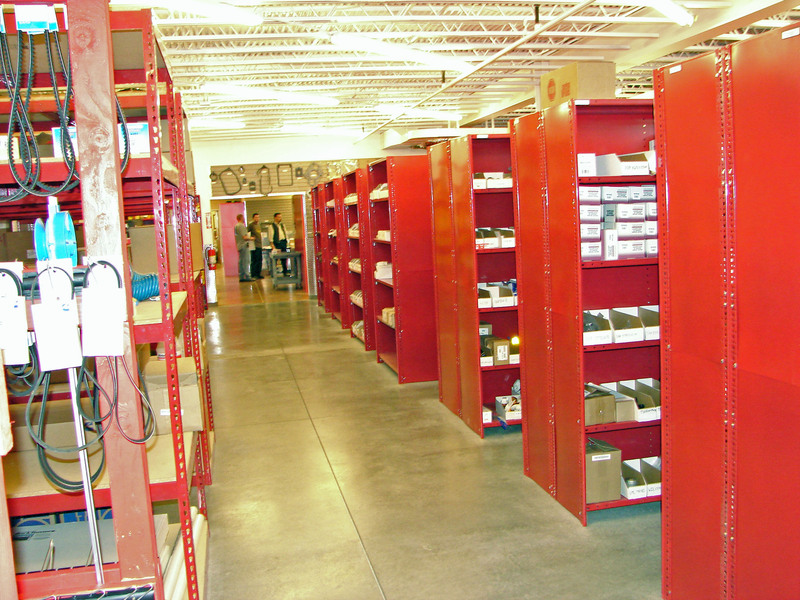 In the showroom is a display of the options on the Outlaw conversions, (right). 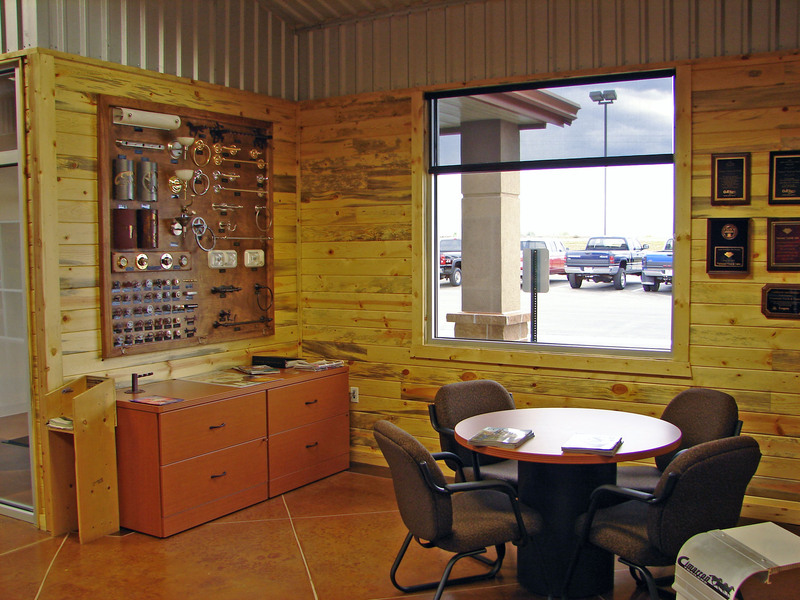 Pick out your wood, lights, handles etc. 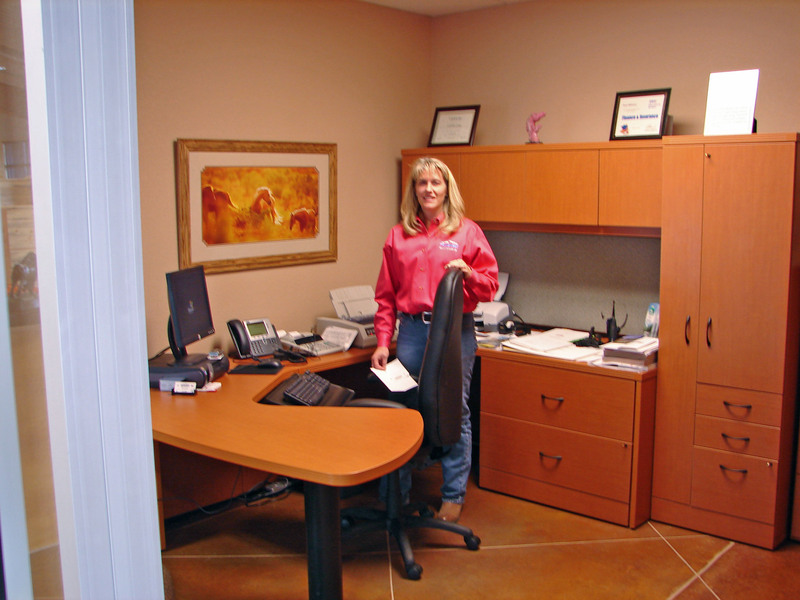 Kim at the welcome desk, she keeps track of Andrew. 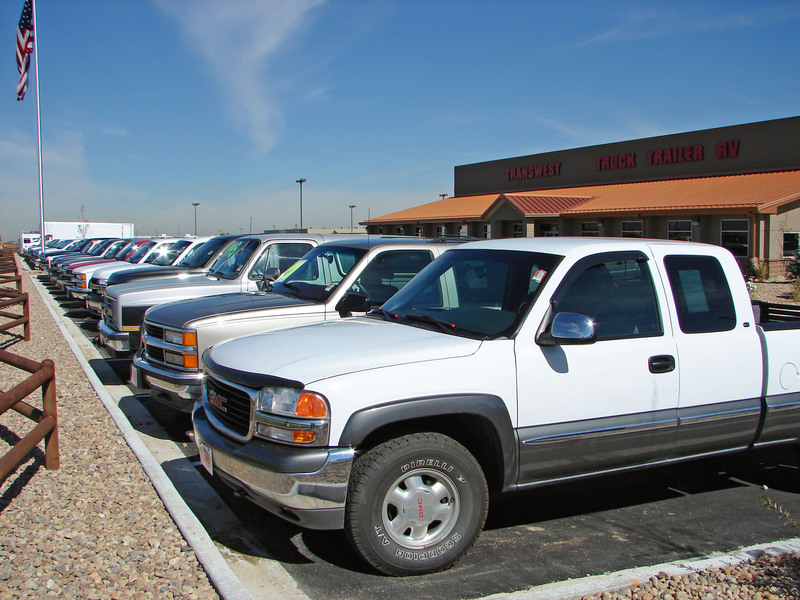 Tami gets the financing done and sells a few trucks. Bill helps you pick out trailers as does Michelle, I’ll get her picture next time. 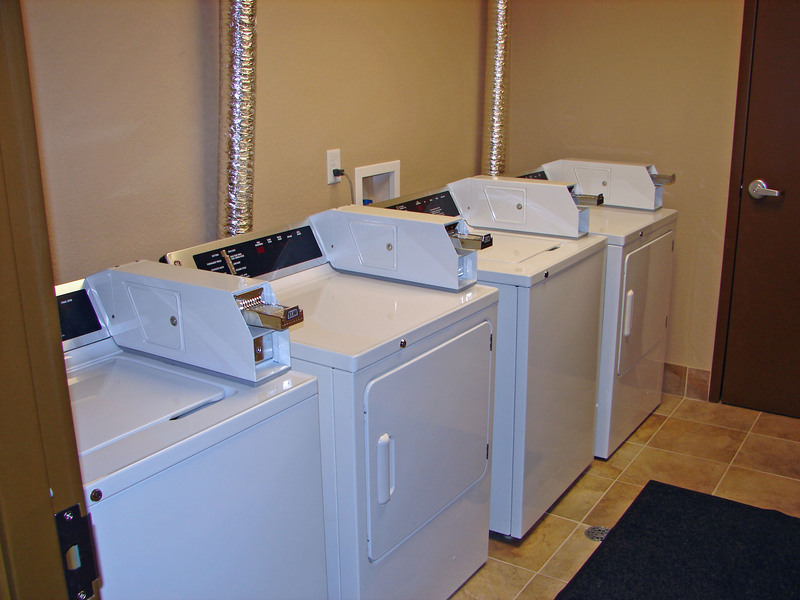 And to be a full service facility they also have you covered if you’re traveling across the country and are lucky enough to break down in Colorado, with washer and dryers, showers, microwaves and some recliners to rest up in while your rig is getting repaired. Plans are for a corral to turn horses out too. 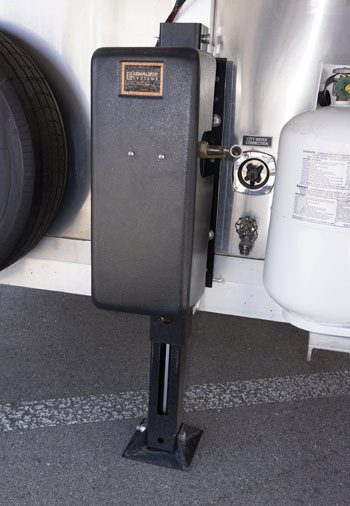 Comes in handy using Transwest Truck Trailer RV parts and accessories before I take new rigs on the road for my national reviews. 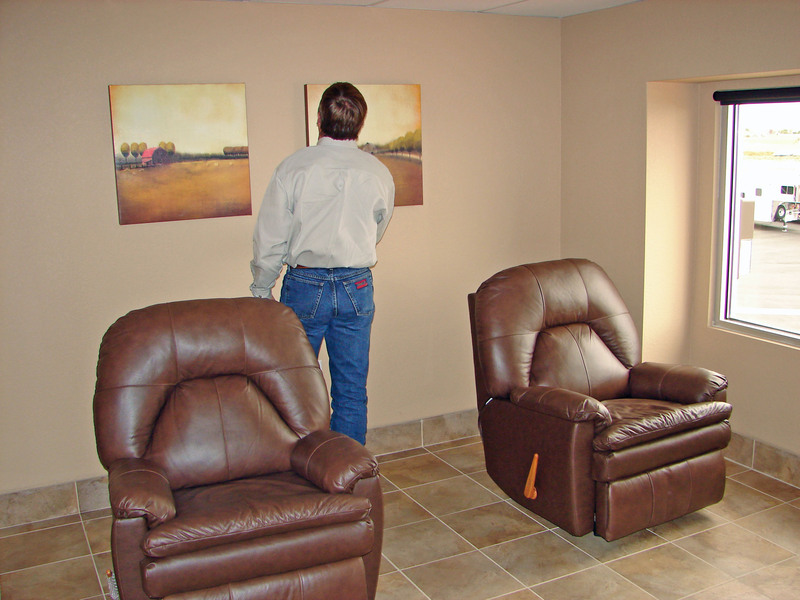 I think I’ll go up to the waiting room, microwave some popcorn, hit the recliner and wait for my truck to be ready. Transwest is adding internet to the waiting room, so I can catch up on today’s 200 emails. 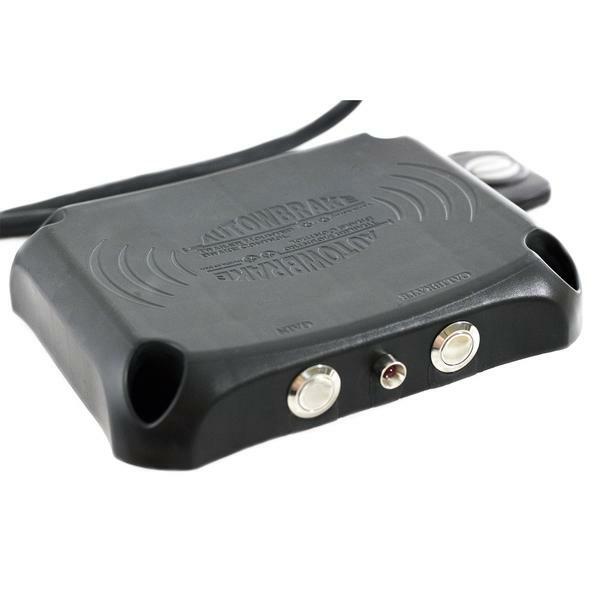 Sales manager Andrew Lyons built this trailer wiring tester (left), that will tell you what does and doesn’t work on your wiring just by plugging it in. Transwest installed my new Power Vision mirrors that I’m reviewing along with the Odyssey trailer brake controller for my project truck. 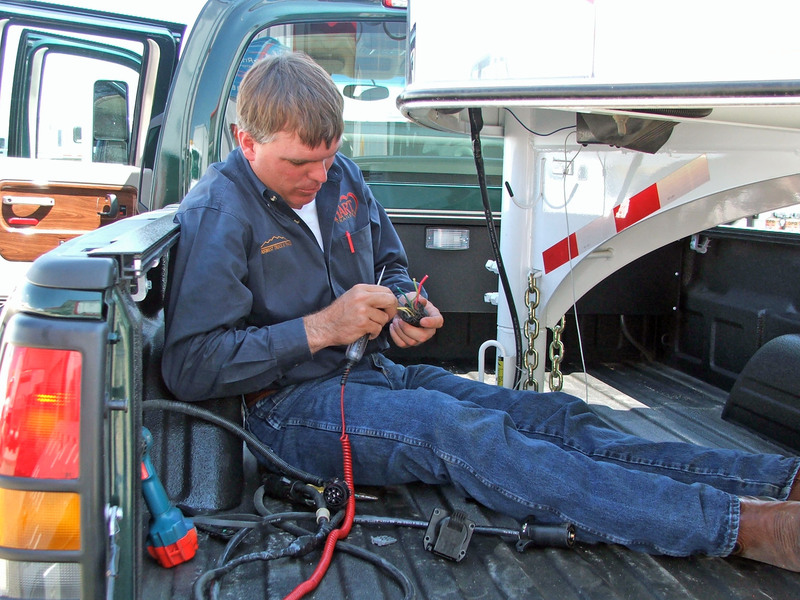 As the “trailer guru” Andrew Lyons repairs some of the trucks I review before I hook up to a trailer. 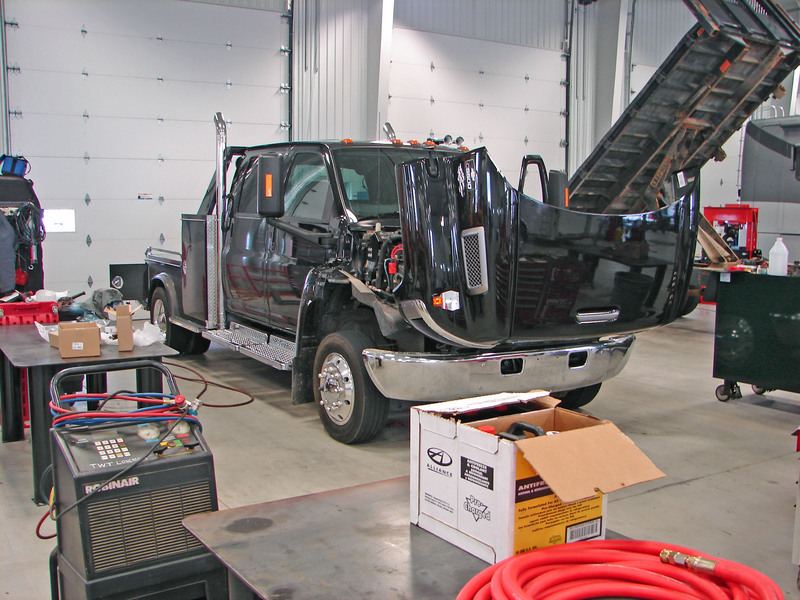 He’s had to rewire new truck factory trailer harnesses for me (right). 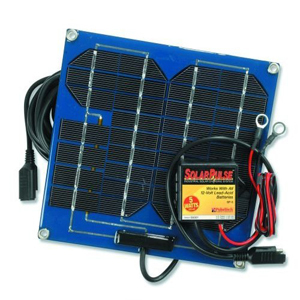 They sell power modules, chips, exhaust and air intakes. 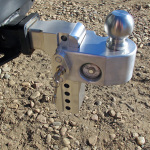 And a product dear to my heart when towing in the Rockies, exhaust brakes. As the sign says in the picture in the far right, we have some steep grades in Colorado. 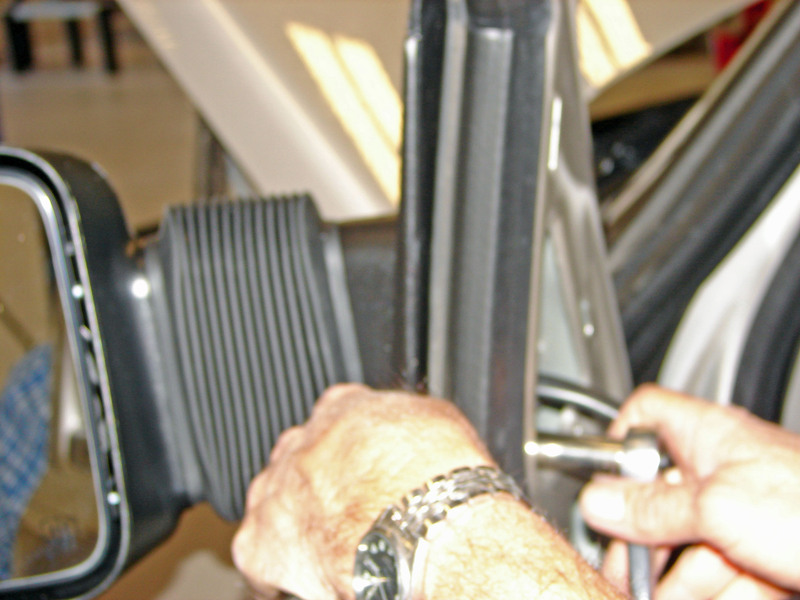 Exhaust brakes will bring you down those passes with very little brake pedal. 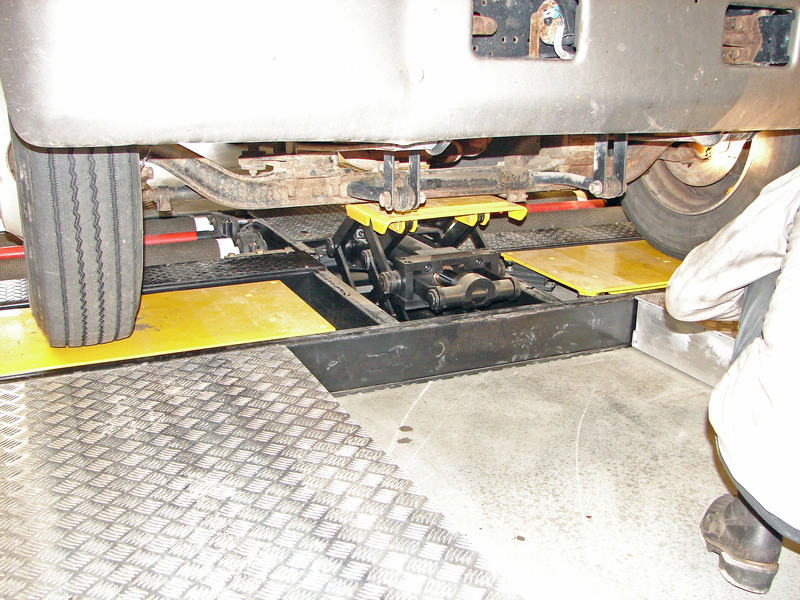 Transwest has super jacks that can jack up a rig anywhere, RV or truck. I saw a set in action at SEMA this year. They had a tractor trailer rig off the ground high enough to walk under. All that from a generator too. 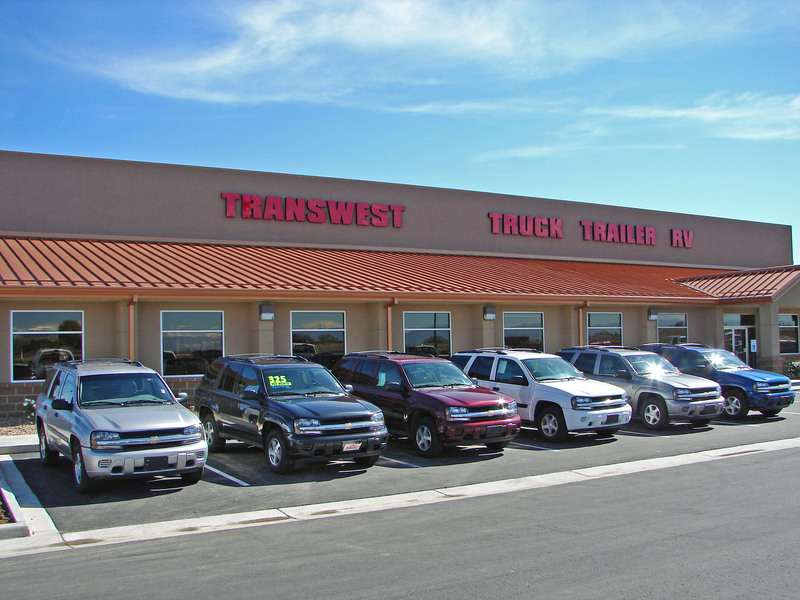 Transwest is trailer towing headquarters with New Freightliners, Western Star and Sterling. 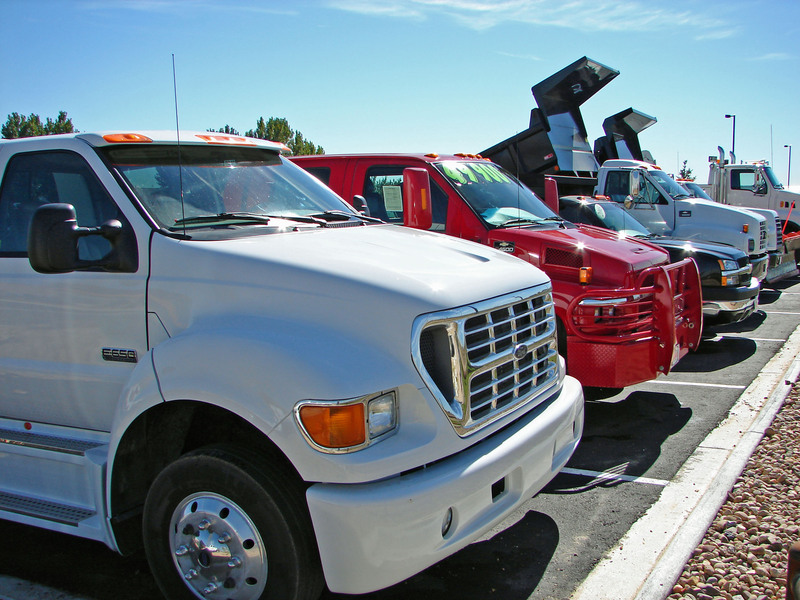 Along with one of the best selections in used trucks built for safely towing large trailers. 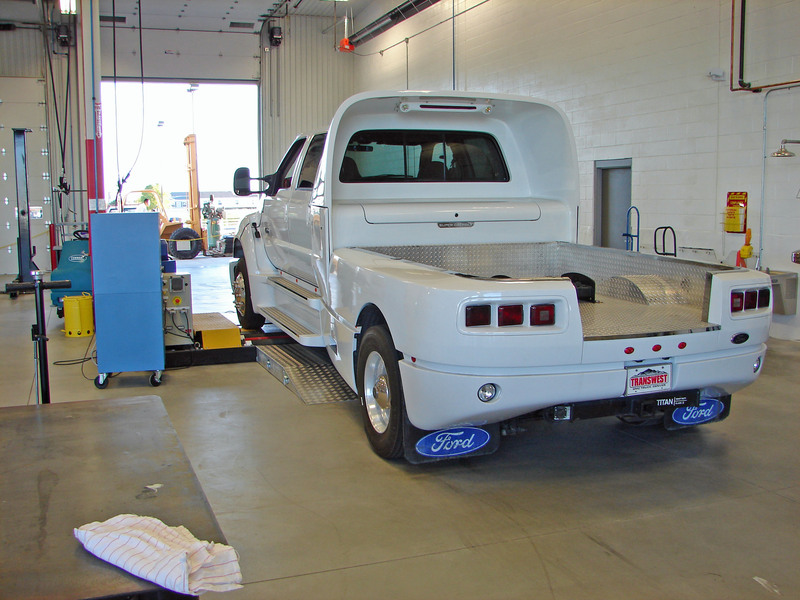 It’s not easy finding the trucks that are equipped just for trailers. 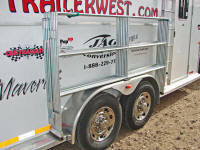 Trailers are growing, so should your truck. Big difference in the size of brakes, axles, springs, frames and weight. 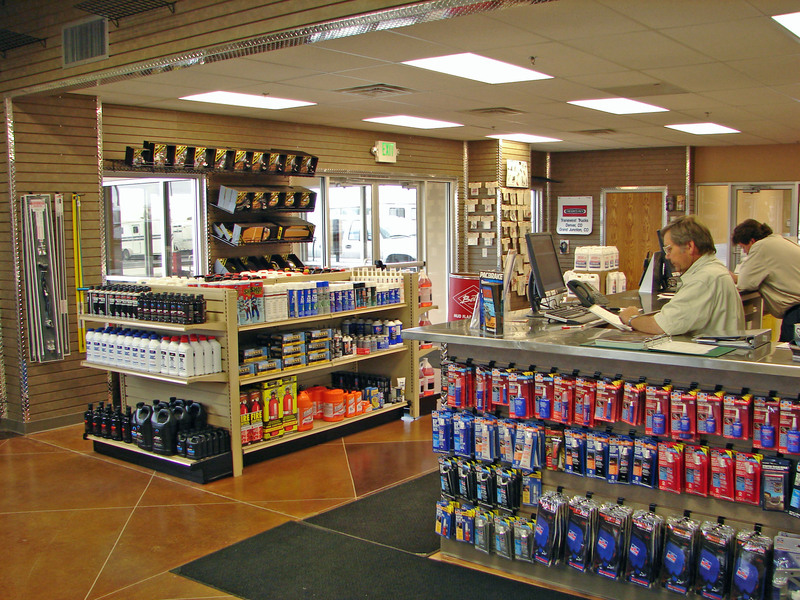 Factory authorized service and warranty center for Freightliner. 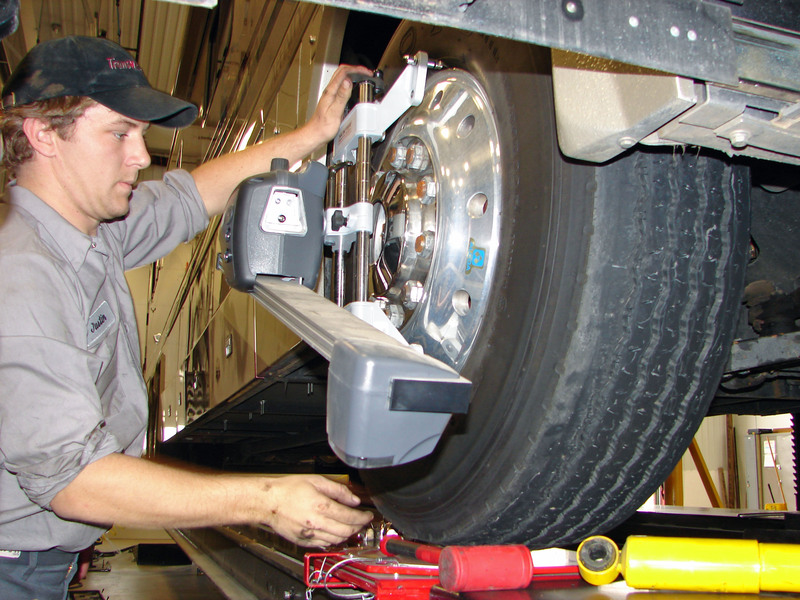 Certified for CAT, Allison, Detroit, Mercedes, Cummins, Sparton and FCCC. 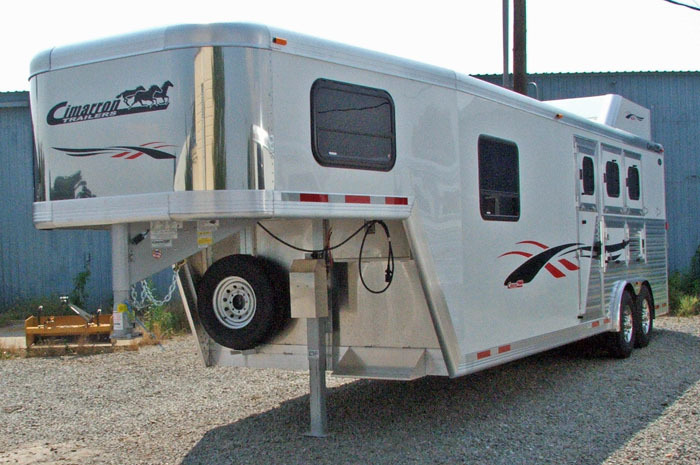 All the trailer options you could think of. 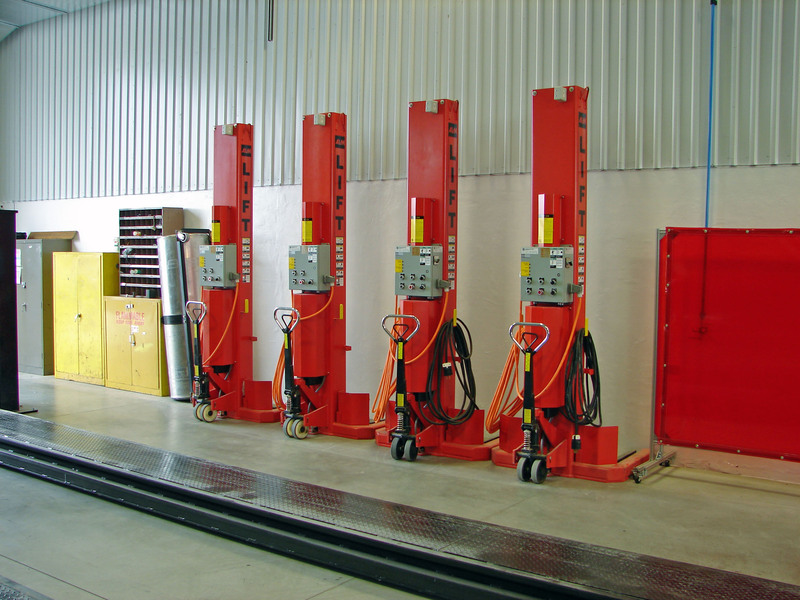 Air ride axles, disc brakes, flooring, in-motion satellite TV, electric over hydraulic trailer brakes etc. 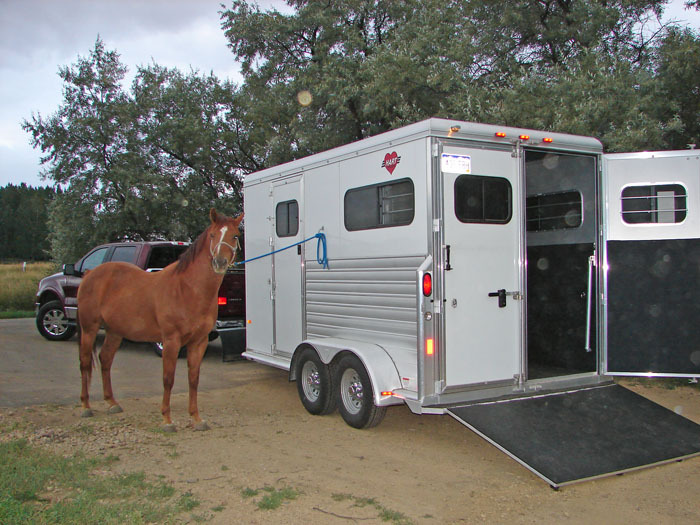 Andrew Lyons is always looking for new ideas to make horse trailers better. 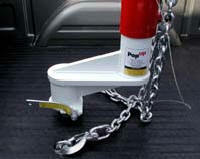 And he helps me test the trailer products I find. 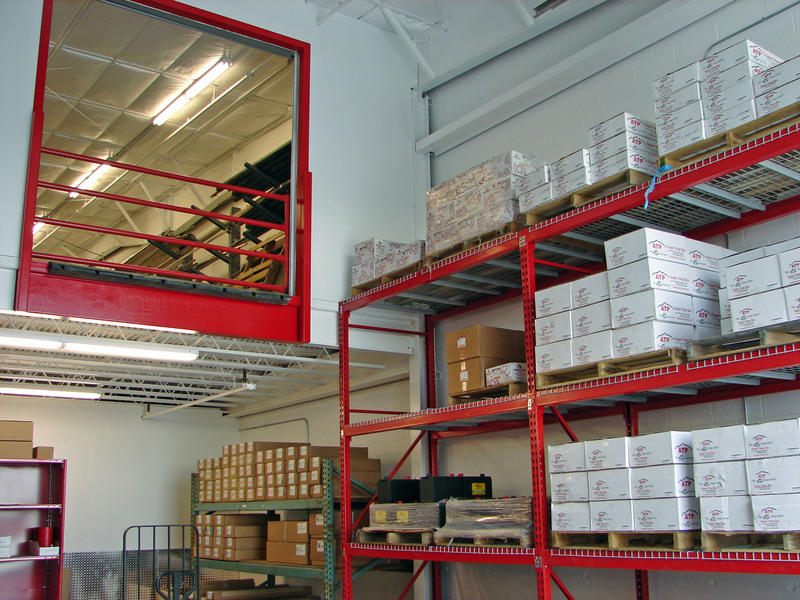 A warehouse full of parts and accessories with a fleet of delivery trucks. 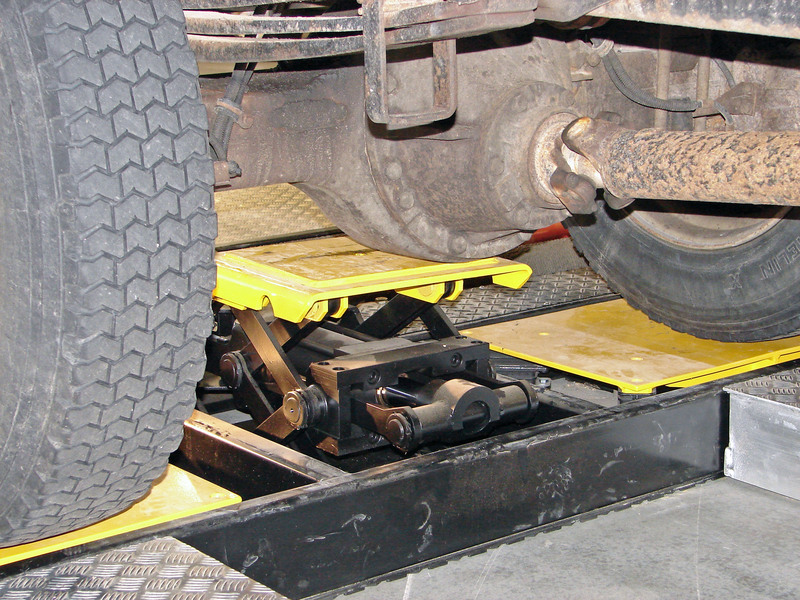 Floor tie downs for straightening axles (left). I told Andrew not to plant the rocks too deep or they wouldn’t grow (right). He thought I was spreading too much fertilizer. 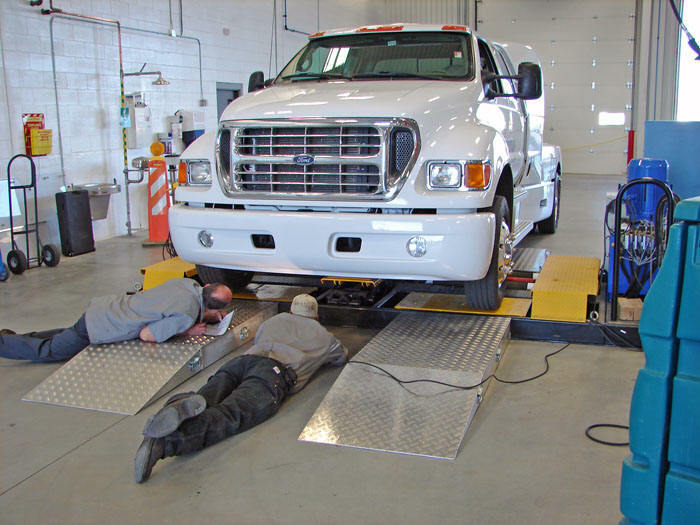 Super table jack, (far left) Transwest Truck Trailer RV service department has the equipment to get you back on the road fast. 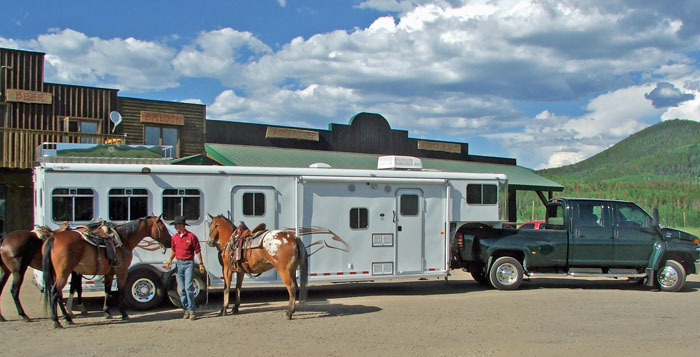 Living Quarters horse trailers at Transwest benefit from working with and on RV’s. 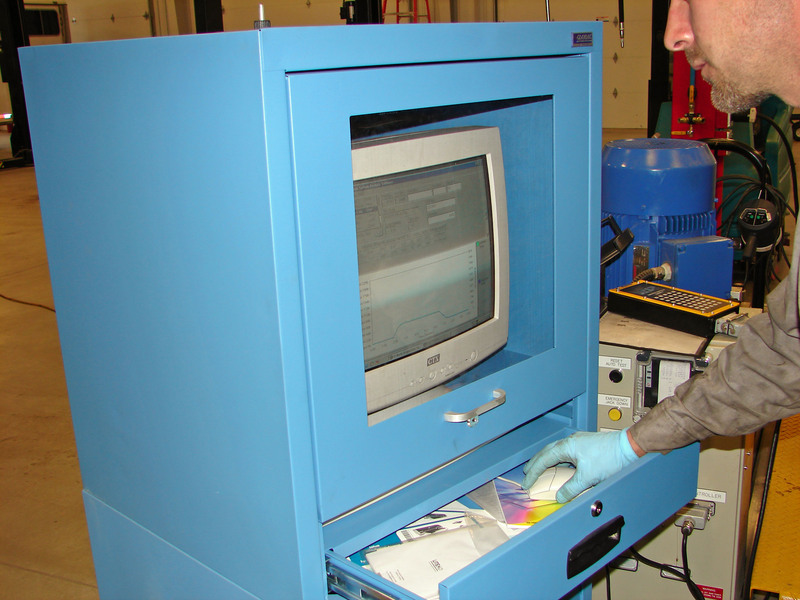 As LQ’s get larger, so must shops that work on them. 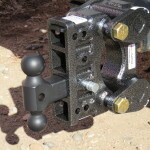 You don’t use your handyman jack to lift these. You actually do need to know how to lift that much weight without damage. 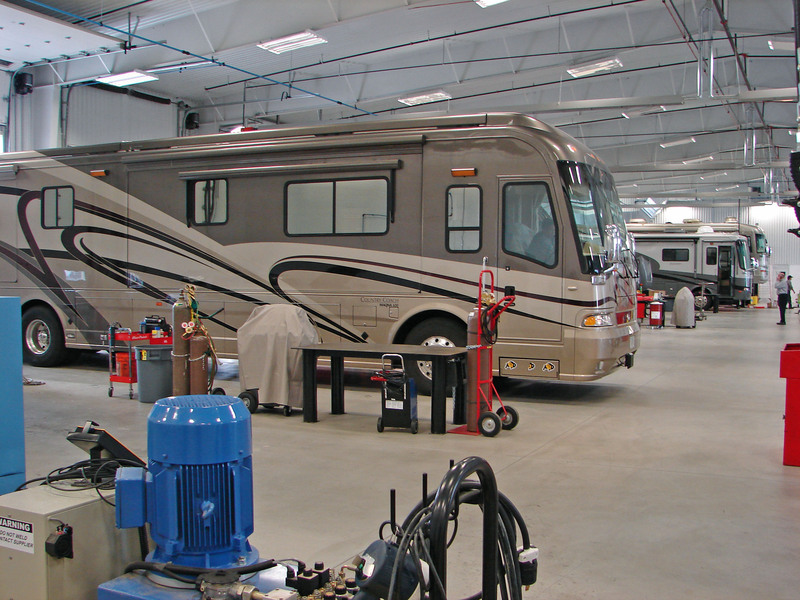 RV repair central, state of art facility with a shop that stays clean. 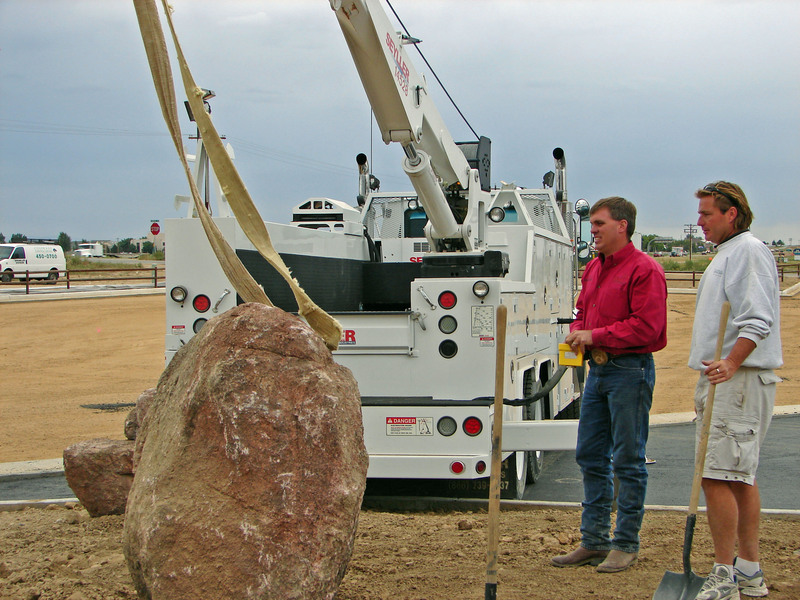 It’s great having the right equipment for the job. Trailers, trailers, and trailers. And Christmas is just around the corner. 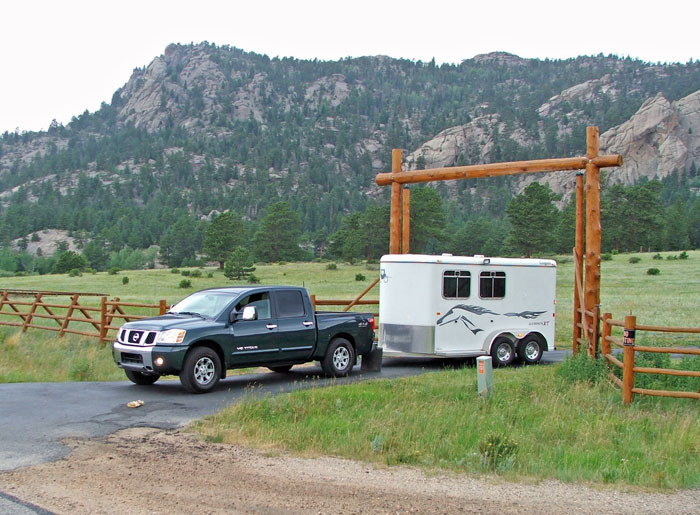 I thoroughly enjoy towing horse trailers. 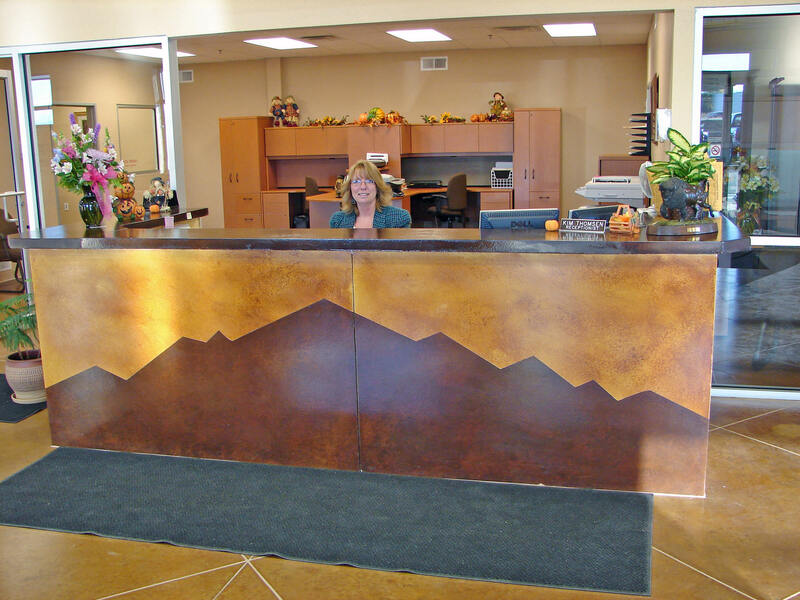 Come by and see the great view of the Rocky Mountains.